Welcome to Sparrow and Blossom and a $500 giveaway! My spring line is finally here and I am so excited to share what’s in my shop with you! I am so ready for spring and I was so inspired by color and nature. Here are some other peeks…. Now for the $500 giveaway! do a blog post about it for 2 extra entries! for a total of 5 entries!!! The giveaway will be open until next Tuesday, March 20th. You can view the full collection in my shop. Jen, how nice of you to host a giveaway! Count me in! What a wonderful giveaway! So pretty! Did you paint the flower painting? I love that too! Sparrow and Blossom – love it!! It’s a great collection Jen….I am very impressed! Of course I would love to win, who wouldn’t?!?! Thanks for the chance!! Ah, what a fantastic giveaway!! Thank you so much for hosting. I’m a follower…fingers crossed! colleen at TheRestarterHome dotcome! Ok my dear Jen you are way too kind….look at all those stunning things,your going to make some lucky girl squeal like a child!!! Have a wonderful day! Gorgeous spring collection. I knew it had something to do with flowers 🙂 I’ve enjoyed following you…what a great giveaway! Oh my goodness~Gorgeous Jen! Wouldn’t expect anything less though from you!!! Love the name too! I love everything!!! Soooo cute. I will have to buy something to add to my collection of Jen Rizzo goodies! GREAT collection Jen and the title?? I never would have guessed it (and I didn’t..lol!!) but it’s delightful!! Off to check out your whole collection. oh, and I already follow your blog! I posted about this on facebook (Sherry Lee is what I go by there). wow!! what a beautiful collection and a wonderful giveaway! thanks so much what offering it. These are so cute! How generous of you to do this. it’s gorgeous jen. love every item. congrats to you!!!! what a great giveaway!! The photos are just fabulous!!! Love your items! Will have to visit your shop! Count me in for the giveaway! I am follower of your blog and love it! i wish i would win this.. good luck to everyone! Beautiful collection! And a generous giveaway! Oh, Jen! You did an amazing job! Can’t wait to order the sweater! Well…. and soooo many other items. Totally blown away by the creativity and sweetness of it all! Wow, it all looks so fresh! Thanks for the chance to win…….;). Of course…I am a happy follower! Beautiful things! Thank you for the giveaway. Wow, it’s beautiful, Jen! I’m so glad we got to see full pictures of everything you’ve teased us with! Wow! That’s a lot to be giving away. Sparrow and Blossom have some beautiful things. Thanks! What pretty goodies! Thanks for the chance to win! WOW Jen! Everything is so pretty 🙂 And love the line name too!! Of course I am already a follower!! You definitely have a creative touch. Very beautiful I must say !!! I love your blog!! Have a beautiful and creative day….Chickie -Oh… I love the name !!! Love it all and what an amazing giveaway! Already had to buy a painting, it is all so beautiful. Oh my fingers are crossed as it is all so lovely. I posted your giveaway via twitter. Lovely stuff! And what a wonderful giveaway! I would be over-the-moon happy to win this! how sweet is that pillow?!? thanks so much for offering this! What beautiful things! Just found you today and so happy I did. Fabulous give away too. Crossing my fingers! So impressed, I’m now following your blog! This is an amazing giveaway, Jennifer! Thank you for a chance to win. Beautiful Products! What a wonderful spring collection Jen! Please include me in your giveaway. I am a LONG time follower!! Love your creativity. I LOVE the colors! So fresh and fun! Congratulations, Jennifer! So happy for you. Very well done! Just posted a link on my facebook page (LanaManis). Congratulations on your new line.I already like you on face book.That sounds weird.Anyway I am already a follower too.But I don’t tweet.I will put this on my blog too. Your new line is a beautiful way to welcome Spring!! Thanks for the chance in your giveaway ~ so exciting! Such lovely things, just like Spring! Hi Jen, I’m hoping this works!! What lovely items & WOW! What a generous giveaway. Thanks. Fabulous giveaway. Please count me in! Thanks. Great spring collection. I especially like the frames. WOW! what a generous giveaway! Adorable frames, pillows, well all of it! Thanks for the opportunity to win such delightful treasures! Blessings from Cathy in Idaho. Oh how I want to win all these fabulous items. thanks so much for the great opportunity. It all looks dreamy! What a great collection. In all your spare time! Beautiful work! I heard about your giveaway on French Larkspur. I’m a follower now too. Just became a follower and posted on my facebook. Your Spring line is beautiful. I was first introduced to you and your gifts through Jeanne Olivers e-course. 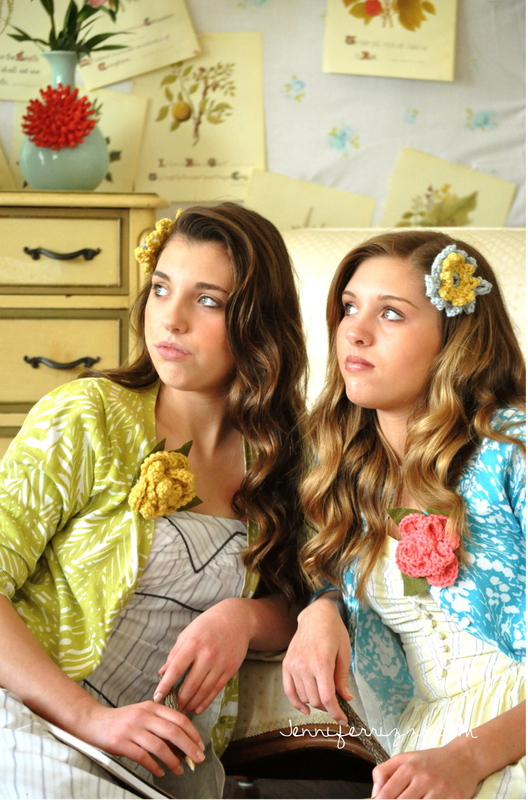 So fun to see your beautiful work in your new Spring Lookbook! your look book is lovely…. What a lot of pretty things, Jen! Your shop is bursting at the seams! And thanks for such a great giveaway…you are so generous! I am a follower! Oh my gosh, what a GREAT giveaway!! Love all you do! Beautiful spring collection. Simple and timeless! Such a bounty of Spring prettiness! Would love to win such a generous prize. And will sign up to follow your lovely blog right away. What a beautiful and generous giveaway! I am loving the paintings and cage dolls! Thank you. Such a beautiful collection! When do you sleep?! What an amazing giveaway! I am already a follower of your blog and your shop on Etsy! Oh my goodness this is such an awesome giveaway!! Yes pretty please sign me up! I have been a very happy follower of your lovely blog for ages! I’d love to win these wonderful prizes. Please enter me. 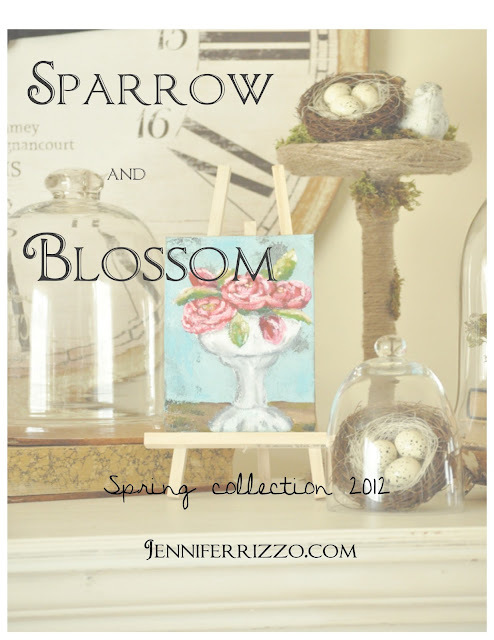 Sparrow and blossom, a beautiful name for your newest line. Love the earthy color palette with spring accents. Robin egg blue is my fav. Wow, beautiful, beautiful, oh yes I would want to win!! I just blogged about the giveaway; it’s beautiful! I’m a follower. And congratulations on Sparrow and Blossom! I just singed up as a follower even though I’ve been following for a while now. Facebook has your name all over it. Happy to let my friends know about you products. Such a beautiful line, a perfect way to greet spring! This is an awesome giveaway! Everything is beautiful. absolutely lovely, congratulations on your new beautiful line! It all looks wonderful! So proud of you and all the beauty you create. Congratulations on the great new line and thanks for the opportunity to enter your give-away! What a fabulous giveaway! Everything is so very lovely. Thank you for this opportunity! The new line is stunning! What a generous giveaway that one lucky winner will enjoy. Please enter me! I am a follower of your lovely blog also. Enter me again, please! I added a link to your giveaway on my sidebar giveaway list. All I can say is gorgeous and what a beautiful giveaway! Love the new line! I’m a follower. Spring! New life in God’s beautiful creation! Thank you so much for this opportunity! I will follow! I’m a follower!!! wonderful blog! Sparrow and Blossom is lovely! I love the vintage details, the paintings, the dolls, the pillows … everything is so pretty! … and the girls look super cute wearing crochet flowers! Swoon! Your work is beautiful, so talented. We are creating 2 ministry rooms in our home and I’m praying that I win. Your things would be beautiful in our new prayer room ;). I’m a follower! I also subscribe by email….thanks! I want to win win win ! What a wonderful giveaway and a stunning new collection. I love it all! Absolutely gorgeous Jen!! What a giveaway! Would love to own some of your creations!! Facebook fan!! As I am a long time follower of yours, I don’t know how I wasn’t already a fan!! Lovely!Please enter me in your generous giveaway.I will follow and find you on facebook too. Beautiful creations! wow! what an amazing giveaway! found you through Traci Thorson (gotta love that girl!) congratulations on your new adventure! Beautiful collection and style….amazing giveaway! Thanks for the chance to win. Great giveaway… So excited about this one! Blogged this great giveaway also! Tweeted also! Thanks for the chance! I dont do facebook but did put on pinterest! You are so talented! Love Sparrow and Blossom! Thanks for this awesome giveaway chance. Best of luck with your awesome new collection! So Beautiful! I love ALL of it! what a wonderful give-away! love your blog and good luck w/ your new endeavor! I’ve followed you and posted on my blog (www.MakeMineACosmo.com) as well as my Twitter account (@alabamavalerie). So lovely & perfect for this time of year. I am also an inspired follower! Also….I will post of Facebook. Thank you again for a chance to win! What an awesome giveaway!!! Just what the doctor ordered (just getting over a nasty lung infection – yuck)!. 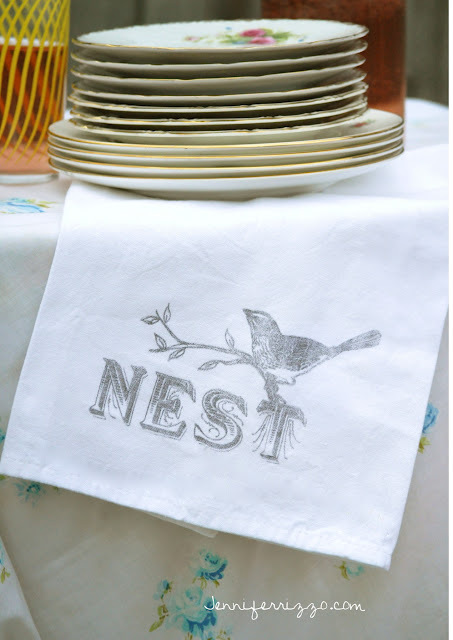 One can never go wrong with birds, nests, spring, etc. I’ve been a follower of your blog for a few months now! I would love to enter!!! Following you too! Your new line is AWESOMENESS! and thanks for a chance to win! Wonderful give a way, I am in. What I love most about the new line is the “banner”… the colors and the birds nest are so peaceful. Oh how I love a give away and this one is spectacular. What a treat! You have such beautiful items. Been a follower for some time…beautiful things! Wowie zowie! What a generous giveaway. Please count me in. Oh and I am already a follower. Please enter me in your give a way! I would love to be a winner, winner, chicken dinner!!! (minus the chicken dinner) thanks!! What a beautiful spring line you have! So excited to know about you and follow you. Wow! Everything is so beautiful and so inspiring! Love it all! Love, Love, Love everything and now following!! Susie Harris Blog Sent me, and boy, am I glad she did. Wonderful and lovely items. Wow! Such a fabulous line of products! Beautiful spring items! Thanks for the generous giveaway! Oh I want!!! I have never been to your shop before! BEAUTIFUL!!!! I love the name, your pictures are beautiful, so inspiring. I am a follower. WOW, this line is so pretty. Love, love, love your pillows, Your collection is perfect for our winter weary homes! Oh, my dreary home could so use some of your beautiful things to brighten it up. What a wonderful giveaway! Such a beautiful collection. I would love to be included in this giveaway. Oh my goodness….what a fabulous giveaway!!!!! Love, love, love Sparrow and Blossom. I’m a follower of your fabulous blog. You have a wonderful style and products…love the colors. I love it all!!! You have a great talent! Wow! Love it all. You have an amazing gift!! Really enjoyed looking today. Pretty and fun Hope to make it to the sale this weekend. Better yet hope to win. Wow, I love all of it–your work makes me smile and to see how professionally you have presented it is just inspiring! I am a follower, actually, I think I am a double follower :)! so loverly! please, please count me in. i’ve got ALL my digits triple dog crossed! What an amazing giveaway! I just discovered you and your shop from My Uncommon Slice of Suburbia and so glad I did! Thanks for the chance to win!! What a lovely collection and a generous giveaway! Thank you for the opportunity! Fabulous items! I’m a follower. I am a new follower but look forward to all your wonderful posts. I love the vintage feel of your collection. Just found you via Susie Harris. Love everything you’ve created! how fun! your items are so lovely. thank you for the chance! OH MY Goodness ….. this would seriously impact my new digs !!! Thanks for the giveaway! Such cute things. I’ve just found you and everything is beautiful. You are very talented. Oh my gosh, everything in your shop is so beautiful! Thanks for offering such an amazing giveaway! I’m a new follower. I’d love for you to follow me back! I love the new collection & will be a new follower! WOW! What an awesome giveaway! Everything is so beautiful! Perfect for Spring. I’d be thrilled to win. I absolutely love your spring collection (just purchased three things LOL) Would definitely love to win your lovelies!! love all of your stuff. so cute! WOW! What a generous giveaway! Count me in! I’m a new follower of your delightful blog! 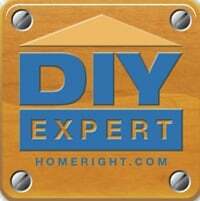 I can’t wait to spend some time parusing your how-to section!!! I love your beautiful items and would love to win the gift certificate! Best wishes on the new collection. Beautiful collection! Thank you for the opportunity to win so many lovely items!!! Beautiful collection, Jennifer. You never disappoint and always inspire! Susie Harris told us to come over, so here i am…don’t know how i have missed your blog! I did join up to follow you….a must! love the creations! Beautiful! I love your stuff! What a fabulous giveaway! I’m happily following along! Your style always inspires me! The pillows are fantastic! Thank you to Susie for sharing! Beautiful collection!! I am excited to enter this giveaway. Wow, what a lovely give-a-way! I’m here! and I love your blog! going to snoop around some more! at any rate, I love your blog! sent over from Susie Harris! My! what a fabulous giveaway – perfect for spring! I simply love your line. I absolutely adore anything with birds and nests. I am a happy NEW follower! I’ve been a follower for a while now! Love your new collection- the pillows are my favorite! I am now a new follower of yours thanks to Susie Harris! Wow! Beautiful site, catalog, everything! Just beautiful! Love it! I followed you on Facebook also. What a fabulous giveaway! Thanks for being so generous! Wow, how have I just now found you? Beautiful things!! I love your new spring line…in fact, i had to buy three things! Love it all! Thanks for the opportunity! I am a long time follower and find you and your blog amazing. Such a gracious giveaway and two beautiful girls and a beautiful book. What an amazing giveaway! So much LOOT! Beautiful, beautiful giveaway Jennifer. I would love to enter. OH how lovely! Hope I win! And I posted the giveaway on Facebook! Fingers crossed! It all looks beautiful, Jen! I can’t wait to see your items at the Vintage Market. What a lovely and generous giveaway! 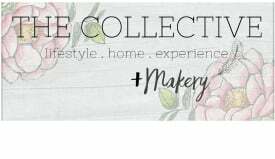 I’m now among your followers and I adore your Etsy shop! oh my goodness….what a stunning collection. I am in awe! Jen, I am a follower via e-mail. And….I’m following you on Pinterest too! BTW – I so appreciate how you listen to the Whisperer. He is sooo good and loving. And just look at the result of your listening. Yay God! What an amazing give-a-way! Love the beautiful items and would be so thrilled to win. Your things are beautiful!! I am also a follower! Thanks for such a great giveaway!! What a beautiful spring shop and a very generous giveaway! 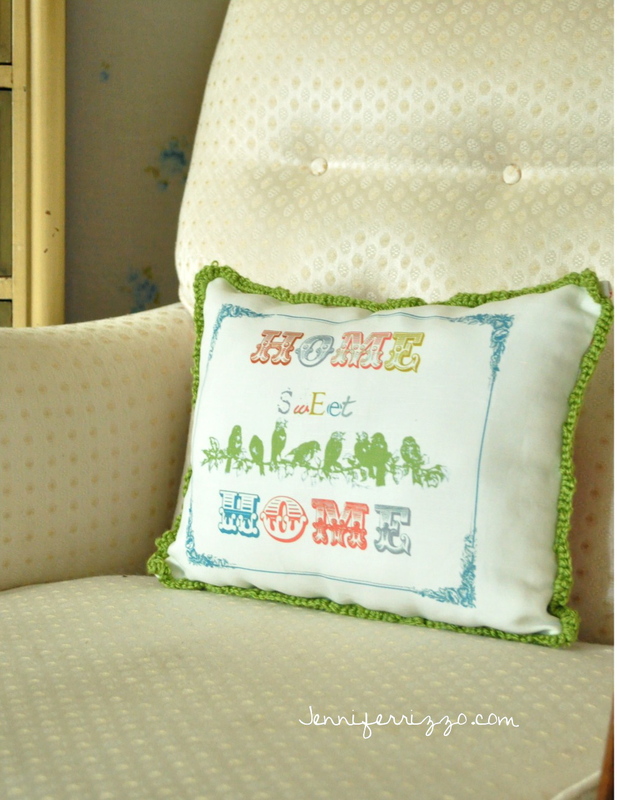 Such lovely pillows, tea towels, picture frames….I love everything! Thank you for the chance on your giveaway, Jennifer. your things are so beautiful I would have to pinch myself if I won! Your things are all so beautiful! I would have to pinch myself if I won. What an amazing job you did for the shoot! The Holy Spirit was without a doubt with you. I am a follower and I am likeing and following everyone you suggest. Your products are awesome. Good luck with everyting. Wow! I love your shop! I would love to win this give-away. 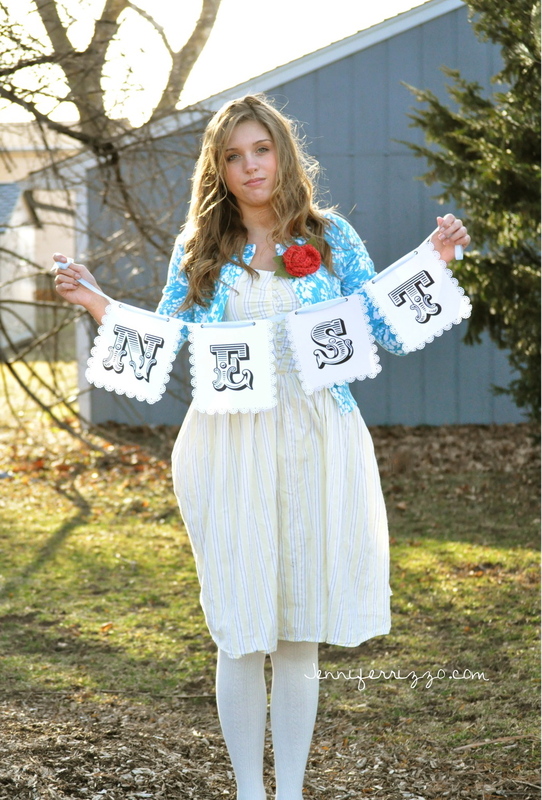 My only daughter is getting married and on a limited budget….she would love to use your items in her wedding/reception. Thank you for your generosity. Hugs and Tweets! Thanks for the giveaway. Love your items. WOW!! Your new line is breath taking beautiful! I already ordered a sweet fun bracelet! 🙂 thank you for this fun chance at the give away! I’m your latest follower! Hooray! AWESOME collection, amazingly generous giveaway – I am a follower, please count me in on this wonderful prize – keeping my fingers crossed! Count me in, I am a follower and huge fan!!!!! Beautiful photo shoot and products! I always enjoy following your blog 🙂 Thanks for the opportunity to win. I love it all! I wish you the best. Everything is just beautiful. Crossing my fingers. I’m SO ready for Spring…everything looks lovely! Thanks for the chance to win such a wonderful giveaway! WOW your store looks amazing!!! Visiting via Jeanne Oliver’s blog post about your new selection. Just linked to FB! Thankyou again!!! Such pretty things…I would love to win! Wow! Found you through Jeanne Oliver! Quite a collection! You obviously have an incredible talent. Happy Spring! Everything looks amazing in your collection. Wow-this is really a wonderful giveaway! Also, I am an email subscriber of yours. Reader Page and follow you via Pinterest. Sweet name and I absolutely LOVE the products! You are so creative! 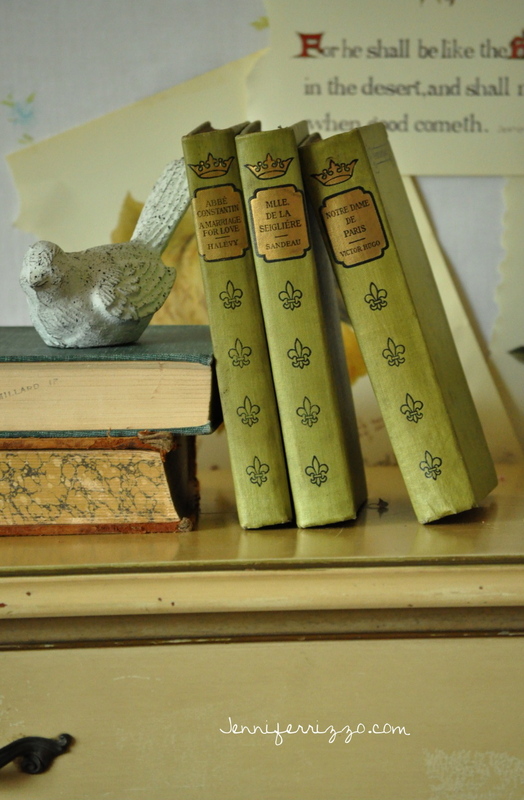 just stumbled into your site… it’s lovely..
Gorgeous items and beautiful blog! 🙂 Thanks for the great contest! I just discovered your collection and I have a new, favorite site! Thank you for all the beautiful eye candy!!!!! Wonderful Spring collection. Very talented and a great chance for us to win some of these great gifts. wow…love your lookbook!! I was sad when there were no more pictures to pore over. how fun! i would love to win! thanks for the chance! Please put my name in for your wonderful giveaway. I am a follower, and I must say that I love your products! Jen, everything is soooo beautiful. Please count me in! Beautiful collection! Everything just oozes Spring! Please count me in! Very sweet, inspirational & generous! I’m so ready for Spring too! Happy Day! LOVE your spring collection! The pillows are so sweet!! Every thing is beautiful and I love your thrift store chair. Thanks for the opportunity. I love your work. Thank you for the opportunity to win such a generous prize!! Yesiree bob, please do enter me! Everything is lovely!!! Love your creativity. Thanks for inspiring us all! 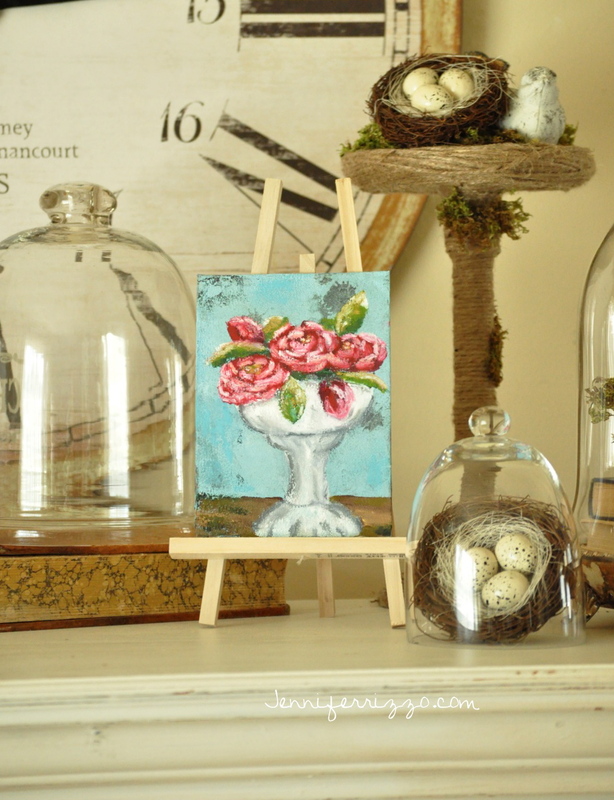 So cute….love love love that painting with the flowers/ turquoise and red/orange! Beautiful things! And now I’m also a follower! I am a follower, already! Just saw your line and I love it. Already bought two pieces. I would love to win more from your giveaway! So cute. Jennifer, I am now a follower of your blog. Looking forward to all of it! I just posted your giveaway on twitter. I would love to win it! My friend told me about your blog. It is to nice. OK, just posted on my blog. 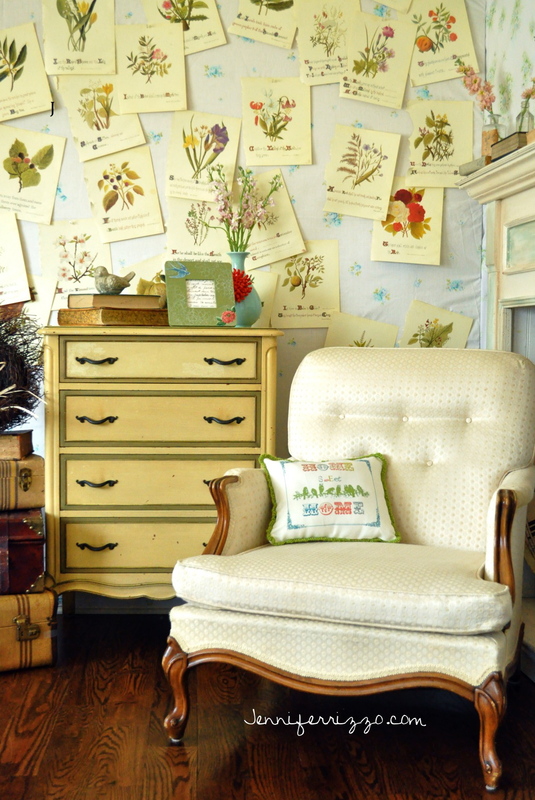 Everything is so lovely, and would fit in so well in my recently refinished (but not so much decorated) back room! Love your website, I would love to win your give-a-way. L.O.V.E. your site and your style. Sign me up for the giveaway! I would love to win this one. Your products are beautiful and would fit right in to my home decor. I love the name of your new line…I don’t think that I could have guessed it! I posted on my blog about your giveaway!!! Love the new stuff!! Great Giveaway! Thanks!! thanks for the chance. i love you creativity. What a wonderful giveaway! I love the collection. Just became a new follower…your blog is great btw. Oh my word! Your things are a feast for the eyes. I hope I win. I’m a follower and so glad I am! I LOVE ALL OF IT!!! I have never entered one of these contests before though I have seen many….your stuff is so lovely, I could not resist!! Thank You! What a great give away! BEAUTIFUL things! Congratulations! Ah, Spring! I’ve just spent the day spray painting frames and furniture and wishing the kids hadn’t “borrowed” my clothesline for a dangerous pulley system in the barn. Beautiful springy things in your shop. LOVE! What an amazing give away. Wish me luck, my home is waiting for an amazing spring make over.. Your blog is a giveaway in itself! Thank you for sharing your creative gifts each week with so many. Your energy is contagious! Blessings to you and your family. Sometimes, through a series of events that one can only classify as complete happenstance, one happens upon a delightful piece of modern literature that provides delight to the one reading it and the one being read it aloud. This truly inspired blog happens to be written by Jennifer Rizzo, the happy reader happens to be me and the one being read it is the husband. This blog brings laughter, aesthetically-pleasing images and attainable project ideas into our lives. More than that, when corresponding with Jennifer, one quickly finds that she is as wonderful as she appears to be. Best of luck to you with the launch of your new collection! All the best to you! Pretty! Would love to win!! Thanks for the opportunity! how wonderful! Love it all, dropped by here from dreamy whites! I am a new follower, found you on Pinterest! Love your spring line – it would be so Fu to win! Pick me, pick me! I would so love to win your wonderful products! Wonderful giveaway, Jennifer! Thanks for the opportunity. Jennifer, I am already a follower! I am a follower of yours !!!! Wow, love everything!!! Thanks for giveaway! Just found you via Dreamy Whites. Gorgeous collection & I will be purchasing from your amazing Etsy store 🙂 Happily a new fan. Love this giveaway, sign me up! What a great giveaway. I am already a follower. I shared a link to your blog on my FB page. I just found you site. You have some wonderful stuff! Oh, I could live in your shop! The style is ME! And what a wonderful give away! Ooh my…. your new lines only get better and better. Such an inspiration for my decorating. How I would LOVE to win this giveaway. And I am so blessed how you trust in the Lord for your inspiration, thank you for giving Him the glory. and I am a follower of you blog (and I sure do love it! What a beautiful giveaway. Your art and producys are just wonderful. What a dream…to win all of those beautiful things! Sign me up for the giveaway! I’m a follwer. Hi there, Jennifer. I just found you through Post Road Vintage and joined you as a follower on GFC and Linky Followers. Just beautiful..Its great to find new designers! Beautiful and so springlike! I’ll be a follower 30 seconds from now. Definitely want to be entered! I am a follower! I love that painting called Distant Day although I think I love everything in that shop! What a generous and wonderful giveaway, Love your shop and blog, happy to follow! I just love your paintings and the sweet little tea towels are adorable as are your pillows. Oh boy! What an amazing giveaway! All of your creations are beautiful, but I expecially love your bird inspired products. Thanks for creating such beautiful things. I am a follower for sure. Love your products. What a fabulous and generous giveaway! So many pretties! Am a brand new follower through RSS. Great blog. I’m already a follower. Love your blog. I love your bird items, especially the tea towel. And I do love that vintage attache case. Beautiful, don’t know how I’ve missed it. your stuff is so lovely! How very generous of you! Thank you. I am a follower and would love to win this give-a-way. Your new line is lovely! I just joined your site. Looking forward to seeing more. Oh my gosh, such beautiful things. Please count me in. wonderful giveaway, I love so many of your new things. I’m a follower also. Please count me in. Such a fab, fab giveaway. This entire post makes me yearn for springtime right this moment! Such a beautiful collection! I would be beyond thrilled to win!!! Thank you for sharing all of your beautiful collection. It would look great in my home. Thanks Again. This is so beautiful, I’m ready to crawl and curl up. Thanks for the fab giveaway – I would be in heaven if I would win. Wonderful stuff, thanks for the chance to win. I love it all! Wish me luck! lovely give away and such sweet things! Hi there..I am a new follower and loving everything I am seeing here..Thanks for this chance to win!!! I am now following you here! Love your blog and your products! Your items are just beautiful…..will bookmark your page. Hi there..I am a new follower and enjoying everything I am seeing here..Thanks for the chance to win!! I am now following you, too! Thank you so much!! Oh my goodness – what a generous and lovely giveaway! Please throw my name in your hat for a chance to win! Thank you! What a wonderful collection of springtime and more. 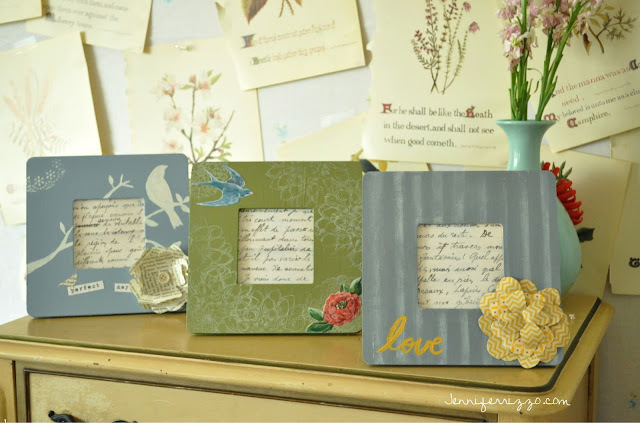 All the bird items leave me swooning and how clever is that chalkboard picture frame. Great job and great giveaway. Everything is so SWEET !!! Thanks for the chance. 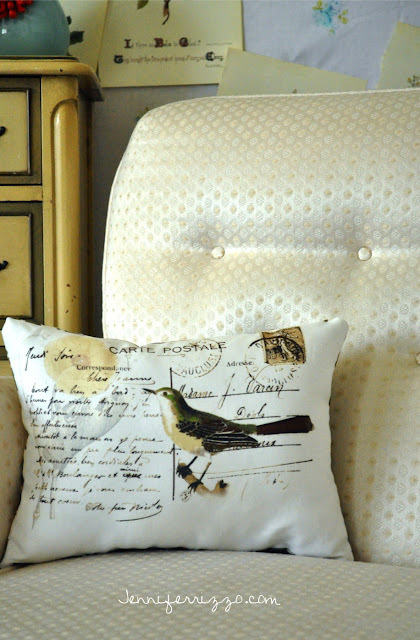 I love everything with the birds (pillow, tea towel, frames, etc) Very sweet! Have been your follower since I saw your kitchen in Country Living! So glad my sweet savannah posted your information. I love your products and decorating style. I just became a follower. I love your blog and etsy shop. So glad my sweet savannah gave us your information. beautiful items! You do a gorgeous job! jen, the colors, the mix of products, the models, the photography– beautiful, cheery, lovely. so happy for you! What a fantastic giveaway! I hope it’s my lucky shot!! Beautiful and tranquil items! Thank you for hosting this! I am now a subscriber and follower! Love your new line! what a great giveaway and shop – glad to have found you! Fabulous giveaway! Love your shop. So perfect for spring. Thanks for the contest. What a beautiful collection, Love it! Amazing giveaway – gorgeous shop – I’m following! Thanks for the chance to win this pretty spring giveaway! I’m your newest follower — your blog is beautiful! So inspiring and perfect timing! Love this! Count me in. Wow!! I really enjoy your blog and your products. Thanks for the opportunity. Fingers crossed!! I’m a follower of yours. You do beautiful work! Such a fan, so cute! Thanks for the giveaway! Everything is so sweet! Hoping I win- so many of my girlfriends would love these as gifts! What a generous giveaway! Love everything! What a fabulous giveaway! Love it all! what a great giveaway…. everything is adorable! I would love to win. Pick Me Pick Me!!! I would love to win. Pick me!